Zinc is a trace, but essential, mineral used as part of your cells’ metabolism. It plays a role in your body’s immune system, as well as wound healing, cell division, and protein production systems. It is integral for developing a proper sense of taste and smell. While zinc is described as a “trace mineral,” this is potentially an understatement. The human body contains around two to three grams of zinc that is distributed across your muscles, bones, pancreas, kidneys, teeth, hair, skin, liver, and blood. To give a sense of how little this is, a feather, a folded dollar bill, or a paper clip all weigh roughly one gram. A nickel weighs exactly five grams. Your body does not produce zinc naturally, and has no means of storing up zinc for later use. If your diet does not contain enough zinc, you will experience zinc deficiency. This is a more prevalent problem than one might expect. On a global level, about 31% of the population has some degree of zinc deficiency. Due to its role in the immune system, the World Health Organization considers zinc deficiency to be the fifth-leading risk factor in causing diseases. In addition, there is a genetic condition called acrodermatitis enteropathica, where the body naturally has trouble absorbing zinc. In addition to the normal symptoms of zinc deficiency, the rashes of those with enteropathica tend to appear around the eyes, nose, mouth, and buttocks. The rash tends to start appearing after the infant is weaned. Unfortunately, there is no clear test for zinc deficiency. A diagnosis is made with a doctor’s evaluation. GI disorders such as Crohn’s disease or short bowel syndrome both decrease zinc absorption and can increase zinc losses from the GI tract and the kidneys. Chronic diarrhea can also cause zinc levels to fall. Zinc is mostly found in animals with only minimal levels present in certain vegetables. Furthermore, vegetarians typically eat higher levels of legumes and whole grains. These foods contain a substance called phytates, which can bind to zinc and make it harder for the body to absorb. Many vegetarians actually need to consume up to 50% more zinc than the recommended daily value in order to ensure they get the proper amount. Considering the role zinc plays in the body’s development, it should come as no surprise that a growing fetus needs a lot of it. Women who are already at borderline zinc levels when they become pregnant have a higher risk of becoming deficient. Pregnant women generally have a higher recommended daily intake of zinc (your doctor will prescribe the correct amount). Breastfeeding can also further reduce a mother’s zinc levels. Ethanol, one of the main components of alcohol, reduces the ability of the intestines to absorb zinc and also raises the amount of zinc expelled through urine. Additionally, alcoholics tend to eat more limited foods, further reducing their ability to get zinc from their diet. Approximately 30%–50% of alcoholics have low zinc levels. Certain diuretic medications will increase how much zinc is lost through urine if used for prolonged periods. Similarly, some antibiotics can temporarily impair the ability of the GI tract to absorb zinc from food. It is worth mentioning that there is a bit of wiggle room between zinc’s RDA and the upper tolerable limit—the amount you can take before you risk developing toxicity symptoms. 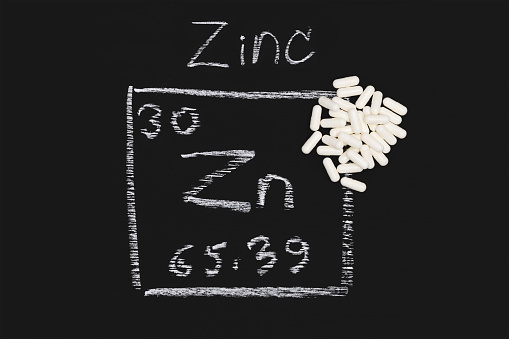 Most people can have a daily intake of 30–40 mg of zinc without risking adverse effects. You can even go over this amount as long as it is not done regularly. Still, you should try to stay close to the RDA when possible. Next, consider the following list of the best zinc foods. Technically speaking, oysters should be at the top of this list. However, a single three-ounce serving of oysters has 74 mg of zinc—493% of the RDA for an adult. As a result, oysters are not considered part of the “best” zinc-rich foods. 1. Braised beef: A three-ounce serving contains 7 mg of zinc, or 47% of an adult’s daily value. 2. Alaskan king crab: Oysters are an anomaly among seafood. Three ounces of cooked crab contains 6.5 mg of zinc, or 43% of the daily value. 3. Beef patty: A three-ounce boiled beef patty contains 5.3 mg of zinc, or 35% of the daily amount. 4. Cereal: Many breakfast cereals are fortified with zinc. A three-quarter-cup serving of fortified breakfast cereal contains 3.8 mg of zinc, or 25% of the daily value. 5. Lobster: Three ounces of cooked lobster contains 3.4 mg of zinc, or 23% of the daily value. 6. Pork loin and baked beans: A cooked three-ounce pork chop contains 2.9 mg of zinc, or 19% of the daily value. A half-cup of baked beans has the same amount. 7. Chicken and dark meat: Three ounces of cooked dark meat has 2.4 mg of zinc, or 16% of the daily value. 8. Low-fat fruit yogurt: Eight ounces of low-fat fruit yogurt contains 1.7 mg of zinc, or 11% of the daily value. 9. Dry roasted cashews: An ounce of cashews contains 1.6 mg of zinc, roughly 11% of the daily value. 10. Cooked chickpeas: A half-cup of cooked chickpeas contains 1.3 mg of zinc, or 9% of the daily value. Note that certain vegetables, legumes, or grains may contain similar or higher zinc values than those on the list. They are not included because, as mentioned previously, their phytate content prevents their full zinc content from being absorbed by the body. In addition to dietary sources, zinc also comes in other forms. Dietary supplements of zinc are common, such as zinc gluconate, zinc sulfate, and zinc acetate. Zinc is also found in numerous medications, particularly for colds and in throat lozenges. Certain denture adhesives also contain zinc, but when used as directed, the amounts are negligible—even by zinc’s standards. Since it is present in such minute amounts in food, it is not (normally) feasibly possible to “overdose” on zinc unless you go to town on an oyster buffet. It is possible to take in toxic levels of zinc from the misuse of supplements or zinc-containing medicines; eating from poorly coated galvanized containers; or inhaling zinc oxide fumes (a hazard in certain industries, known as “metal fume fever”). If zinc poisoning is suspected, call 911 or poison control immediately and drink some milk unless told otherwise by medical personnel. Milk will coat the lining of the stomach and slow down zinc absorption. Once at the hospital, a stomach pump may be performed to flush out any remaining zinc in your stomach. Depending on the strength of the overdose and the amount of time that has passed, more advanced steps would be taken to further flush the zinc from the body and to counter symptoms. For instance, if signs of copper deficiency start appearing, you may be given a copper serum solution. There are no treatments available for chronic zinc toxicity. Your physician will likely recommend a series of dietary or lifestyle changes to reduce your intake levels and they should return to normal eventually. Unless you suffer from industrial exposure, zinc toxicity is not difficult to avoid. Common-sense measures, such as following dosage instructions on supplements and medicines, and not gorging on oysters, will ensure your zinc levels remain well below the toxicity threshold. “How Do I Treat Zinc Poisoning?” WiseGEEK web site; http://www.wisegeekhealth.com/how-do-i-treat-zinc-poisoning.htm, last accessed July 29, 2015. Johnson, L.E., “Zinc Deficiency and Toxicity – Disorders of Nutrition,” Merck Manuals Consumer Version; http://www.merckmanuals.com/home/disorders-of-nutrition/minerals/zinc-deficiency-and-toxicity, last accessed July 29, 2015. “Zinc Poisoning: MedlinePlus Medical Encyclopedia,” U.S. National Library of Medicine web site, February 1, 2013; http://www.nlm.nih.gov/medlineplus/ency/article/002570.htm. “Zinc — Health Professional Fact Sheet,” National Institutes of Health web site; https://ods.od.nih.gov/factsheets/Zinc-HealthProfessional/, reviewed June 5, 2013.